Top to bottom: The newly crowned Little Miss Southwestern for 2014-2015 Miya Sam pose for a photo with first runner-up Riley Yellow. If Sam is unable to fulfill her duties as Little Miss Southwestern, Yellow will step in and take over her duties. 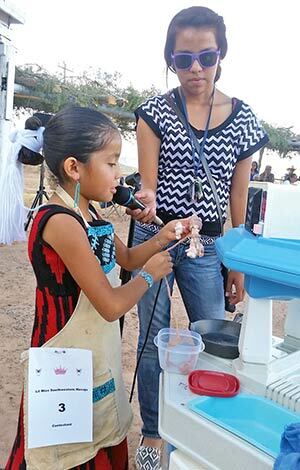 Miya Sam, 7, from Ganado is wrapping sheep intestines around sheep fat to make achii as part of her traditional talent during the Little Miss Southwestern Navajo pageant at the Southwest Navajo Fair on Sept. 19. Her sister Miral Sam helped her set up her skits during the pageant. 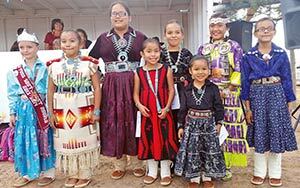 The Little Miss Southwestern Navajo Pageant was held on Sept. 19 at the Southwest Navajo fair in Dilkon, Ariz. Pictured is outgoing Little Miss Southwestern Navajo Aiyana Yazzie and the seven contestants that competed for the 2014-2015 crown. Nothing proves you’re a Navajo princess like sheep intestines. 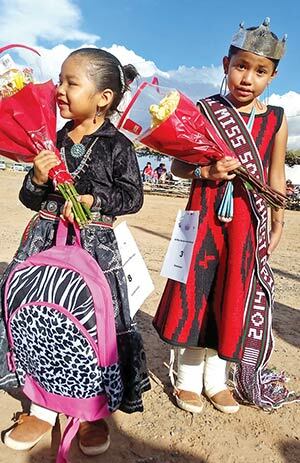 At least that is what the newly crowned 2014-15 Little Miss Southwestern Navajo proved when she won over the judges with her ach’ii’-making skills. Miya Sam, 7, from Ganado, Ariz., snatched up the title after she showed off her modern and traditional skills to the four-judge panel. She earned a total of 186 points out of a possible 200. For Sam’s traditional talent she and her sister, Miral, set up a toy kitchen on the fair’s song-and-dance grounds. After she tied her apron on she acted out the processes of making ach’ii’. She pulled out some Tupperware holding her ingredients. She soon held the sheep fat and intestines, letting the judges know exactly what she was doing in Navajo, before wrapping the fat to make ach’ii’. Sam even joked that she would make ach’ii’ at the flea market and sell it for $6.